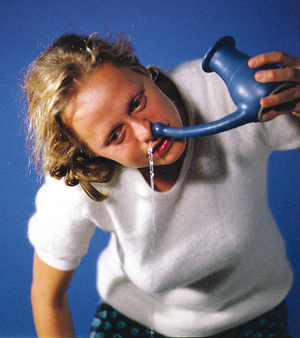 One type of neti-pot used to drain nasal passages: image via vibaku.com Neti-pot nose rinses have recently been reported to have caused the death of two persons in Louisiana. The pots, used by many to drain their sinuses during colds, flu, or allergy flare-ups, convey salt water through the nostrils. According to Louisiana's state health department, the deaths of one man and one woman were attributable to a rare brain-eating amoeba called the Naegieria fowleri, conveyed through neti-pots. This type of amoeba is most commonly found in warm freshwater lakes or inadequately chlorinated swimming pools, but occasionally they can leak through to our tap water. Though neti-pot manufacturers recommend using distilled or sterilized water for sinus drainage, it was assumed that the two individuals who were infected with Naegieria flowleri used tap water instead. That is definitely no-no. As important as sterile water, is thoroughly cleaning the neti-pot after use and letting it air dry. "Tap water is safe for drinking, but not for irrigating your nose," said Dr Raoult Ratard, Louisiana State Epidemiologist. Naegieria flowleri actually cause meningoencephalitis, which leads to the destruction of brain tissue. Initial symptoms include headaches, fever, nausea, vomiting, and stiff neck; later symptoms include loss of balance, seizures, confusion, and hallucinations. Death can occur in from 1 to 12 days.